In the mid-1990s, one trial – the most publicised in American history – captured the attention of the world. After months of televised proceedings, this iconic case came to an explosive end on the 3rd of October 1995. The athlete Orenthal James “OJ” Simpson, a then-American hero, was found innocent of the murder of his ex-wife Nicole Brown-Simpson and a friend of hers, Ron Goldman. And yet despite being found innocent, his reputation was forever tarnished – because the whole world knows he really did it. But the trial’s story was so bizarre and twisty that you quite simply couldn’t make it up, and it makes for riveting viewing in the first series of American Crime Story, a new factual anthology executively produced by the creators American Horror Story. This is The People v. OJ Simpson. Out now on DVD, this absorbing and addictive 10-part series is easily one of the best shows on TV in a long time. Cuba Gooding Jr plays OJ Simpson, the disgraced athlete on trial for murder. His legal ‘dream team’ who quite literally helped him get away with murder are the cocky Robert Shapiro (John Travolta), charismatic Johnnie Cochran (Courtney B. Vance), pompous F.Lee Bailey (Nathan Lane) and the conflicted Robert Kardashian (David Schwimmer). Against him are Marcia Clark (Sarah Paulson) and Chris Darden (Sterling K. Brown), a pair of determined and passionate yet inept prosecutors. The cast are all fantastic – with Courtney B. Vance stealing the show as the media-savvy Cochran, arguably the most iconic man of the trial. “If it doesn’t fit, you must acquit”, he confidently said in his closing statements. That little line might’ve just won the case single-handedly. But his performance isn’t all flamboyance – we see his soft and quiet side, clearly troubled by the case he is trying so hard to win. It raises interesting questions about his character; where do you draw the line between ‘good lawyer’ and ‘bad person’. He’s amazing at his job, getting a criminal free. But does that make him just as much of a villain as OJ himself? Anyway, we’re going somewhat off-topic…The People v. OJ Simpson plays out chronologically and slowly unfolds the increasingly shocking trial in an almost real-time style – with the courtroom scenes phenomenally recreated and theatrically performed. And despite how amazing this delivery is, this isn’t even the best part of the show. The show is far more than its subject trial. The People v. OJ Simpson really shines when it delves into the series’ subtexts. Despite a faithful representation of the setting and time period, a lot of the contextual problems discussed in the series are still relevant today. Racism, sexism, domestic violence and a somewhat inept justice system are all still easy to find in 2016 – and that only makes the series more effective, and certainly more shocking. Just like the incredible Straight Outta Compton film, The People v. OJ Simpson subtly holds a mirror up to modern society while telling a story from over 20 years ago. In this world of binge-watching, The People v. OJ Simpson’s 10 parts could easily be watched in a couple of days, and once you start it, you won’t have much choice. 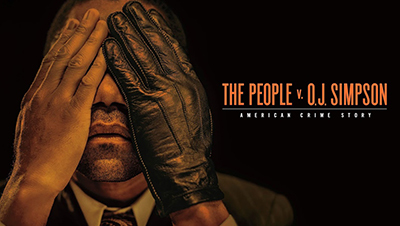 One of the most absorbing programmes of recent years, The People v. OJ Simpson will have you on the edge of your seat up until the stunning climax – and even though we all know how it ends, it still hits just as hard as it did over 20 years ago for a whole generation of people. Watch this show with someone – because you will have so much to discuss after every single episode.